Have just installed a Jenny Kee Aussie bush floral bonanza in the huge graphic window of Melbourne’s contemporary jewellery space, Pieces of Eight – conveniently located next to Neapoli. 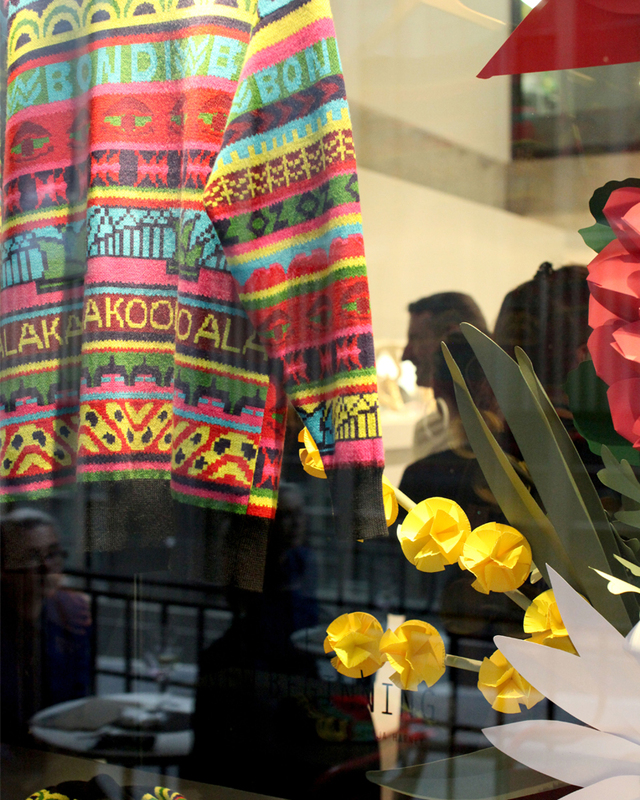 Celebrating the 2015 relaunch of Jenny’s iconic knits entitled ‘A New Beginning’, our display – inspired by Jenny’s passion for native flora – will be up for the next six weeks and forms part of the cultural program of the Melbourne Fashion Festival. The brilliant artist/jeweller Kate Rohde has a concurrent exhibition running in the space. What a great honour to collaborate with some of this country’s leading creative forces!